Woman 2 Woman is a community-based ministry that serves single mothers from all walks of life by providing resources including spiritual guidance, financial guidance, and a sense of sisterhood and encouragement amongst other single mothers. 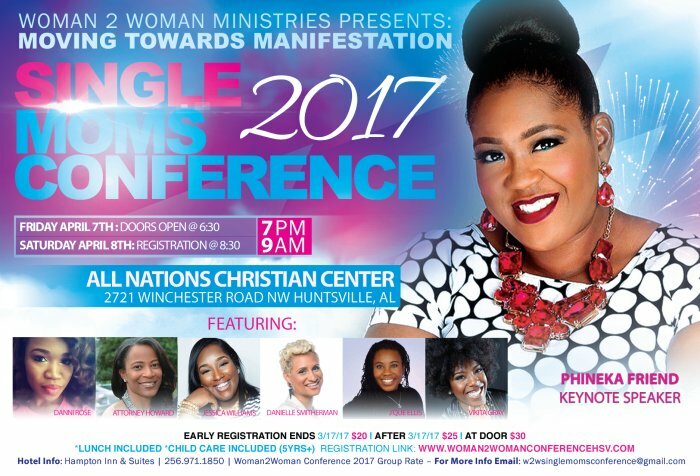 Woman 2 Woman will host its 3rd Annual Single Moms Conference April 7-8, 2017, at All Nations Christian Center located at 2721 Winchester Rd., Huntsville, AL. The conference will kick-off with its Night of Praise and Worship on Friday, April 7th, at 7:00pm. On Saturday, April 8th, at 9:00 am there will be a variety of dynamic speakers and amazing testimonies.